Franz-Horr-Stadion currently known as Generali Arena for sponsorship reasons, is a 13,400 capacity stadium located south of Vienna in Austria. 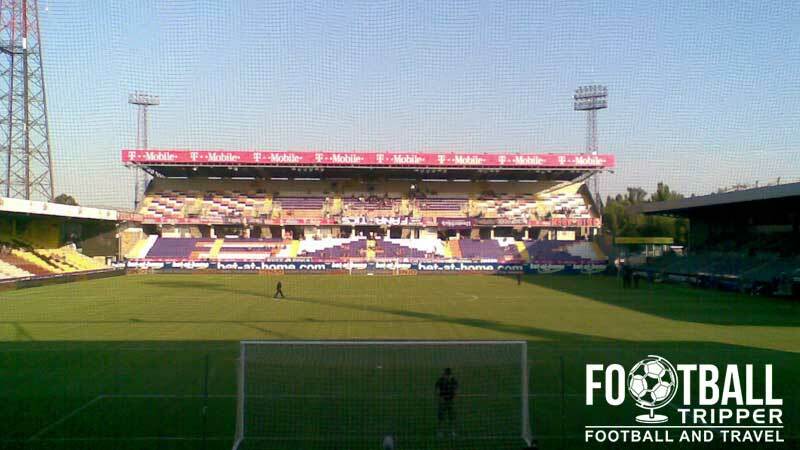 Home to local side FK Austria Wien since 1973, the most recent renovation came in 2008 when the East Stand was rebuilt. 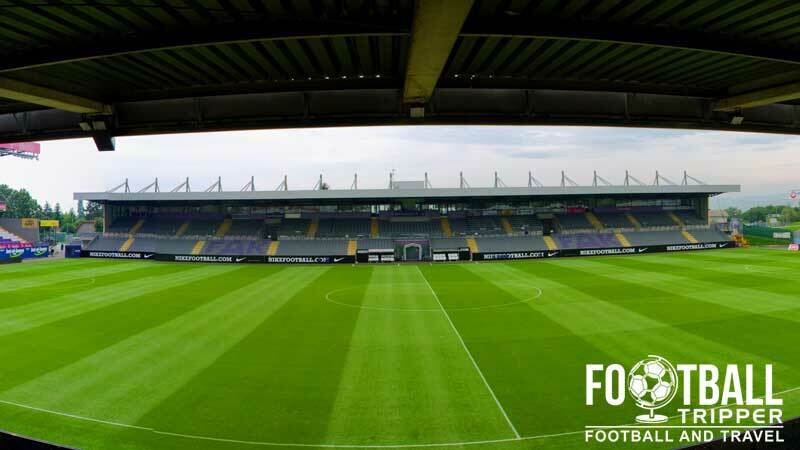 Austria Wien’s stadium dates back to 1925 when it was built as the new home of SK Slovan Vienna who were a football club founded for Czech immigrants. Initially known as the “České srdce” which translates as the Czech Heart, the 10,850 capacity ground suffered extensive damage during World War II with each of the four stands having to be rebuilt following the outbreak of war across Europe. 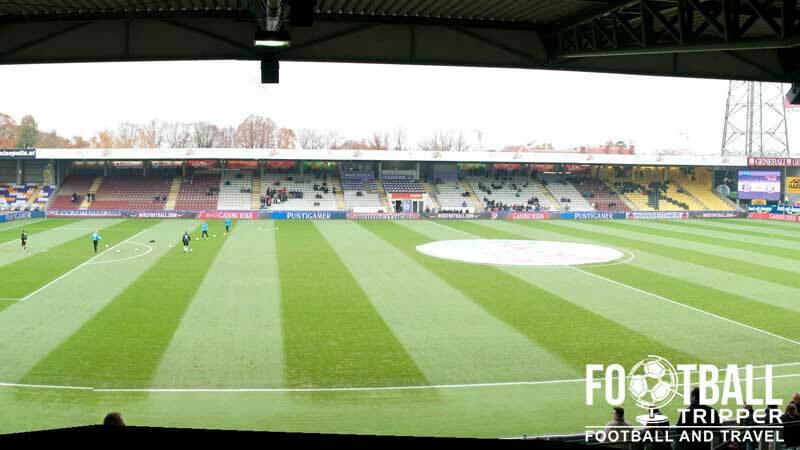 First used by Bundesliga side FK Austria Wien in 1973, the club have slowly invested money in the facilities over the years, most notably twice in training complexes after the first building burnt was unfortunately destroyed by fire. Opening in 1987, the new training ground inspired the Vienna Football association to invest in their own headquarters four years later in 1991. In 1974 the ground was renamed the Franz-Horr-Stadion in honour of the late president and social democratic politician who presided over the Vienna F.A for a period of two years before his death. 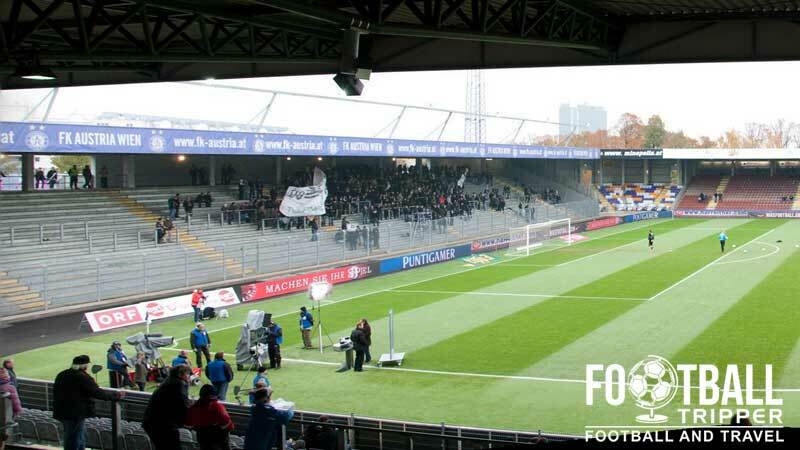 Nevertheless a popular figure, the stadium was renamed the Generali Arena in 2011 after Austria Wien signed a sponsorship agreement with the Italian insurance group, Generali. Not to be confused with the home of Sparta Prague which is also named after the insurance group, the stadium is referred to as just the “Austria Arena” in European competitions as UEFA are not allowed to formally recognize sponsorship names. The current configuration of the stands gives the stadium a maximum capacity of 13,400 with the East Stand becoming a two-tiered stand in 2008 with rail seating to allow both seating and safe standing. Genarali Arena is comprised of the four stands: North, East, South and West. Away fans are housed within the northernmost half of the western goal-end as marked by the blue section on the above seating plan. Visiting supporters should head to West 8 entrance to gain access to the stadium. Within the East Stand there is the Viola Pub which is always popular on both home and away matchdays. 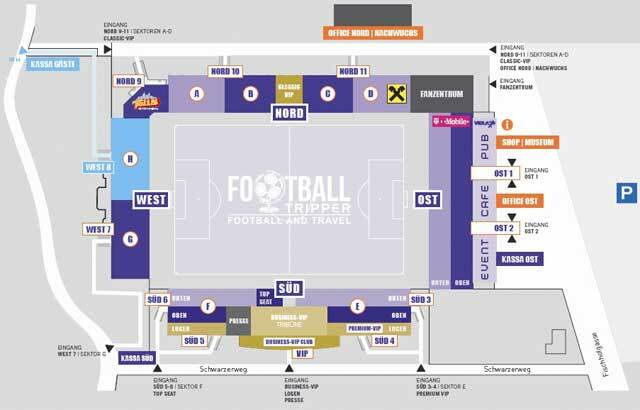 Austria Wien operate a fanshop at the stadium known as the Get Violet Megastore in addition to their own online store which also shares the same name. On Saturday matchdays the shop is open from 9.00 am until kick-off whilst on Sundays the Get Violet Fan Shop only opens for up to 3 hours before kick-off. On both days the store opens for up to one hour after the full time whistle. Stadium tours of Generali-Arena last for around 90 minutes, are suitable for groups of 10 or more and cost just €6.00 per person or €9.00 with access to the museum afterwards. Tickets to see FK Rapid Wien play at home can be purchased via the expected channels: online from the official website, from the Get Violet Megastore during the week, and from the ticket booths around the ground which open before kick-off on matchdays. Expect to pay around €15.00 for a ticket behind the goal and around €25.00 for something central within either grand stand. Generali-Arena sits approximately 6.2 km south of central Vienna within the Favoriten district. Likely to take Football Trippers just over 1 hour and 20 minutes to walk, you’re much better off cutting the walking distance down by using public transport. Parking at the stadium costs €8.00 per vehicle and at least one of the garages operates on a first-come first-served basis on matchdays. Parking Lot II (Unreserved) usually open from around 3 hours before kick-off. Vienna Central Station (Wien Hauptbahnhof) has its own Metro station and is only 3.3 km north of Austria Wiens ground. It is well connected to the rest of the country and Europe via a number of high-speed rail services. You can travel to Generali-Arena by first taking the u-Bahn metro line to Reumannplatz and then transferring to the tram stop of the same name. Proceed to head three stops south to Altes Landgut Stop which is situated within a roundabout just across the road from the stadium. Vienna International Airport sits 18 km south-east and is connected to the city centre via the S7 S-Bahn Line which takes around 25 minutes. Back towards the Reumannplatz Hotel there is the A&T Holdiay Hostel which is very well priced, within walking distance of Generali-Arena albeit not exactly in the most liveliest of locations. Within Vienna’s city centre there are hundreds of places to stay including familiar names such as Hotel Ibis, Ramada Encore and Best Western.